This tastes as good as it looks. This is the latest in my series of Asian food that usually goes horribly wrong in North American Chinese restaurants. I say wrong, because many establishments “dumb down” their food for our tastes. In these recipes I try to bring these dishes back into a slightly more healthy space. I do have to say, this can’t have started as Asian food – no way. I've never seen an authentic recipe that calls for that much sweet/sour sauce. It would be like floating everything in a puddle of gravy and calling it North American. I do have to admit, this one isn’t probably very much better for you than the junky versions. But it's good. It still has sugar, but how else are you going to make a sweet-sour sauce? I "tarted" it up by adding lots of natural flavours. It has a healthy does of garlic and perhaps a worrying amount of Thai bird’s eye chillies. Bird's eye chilli or "Thai chilli" (Capsicum frutescens), is commonly used in Southeast Asian cuisine. It can also be found in the dishes of India. it is often used in traditional dishes of the Kerala cuisine of Southwest India as well. The bird's eye chilli plant is a perennial with small, tapering fruits, often bunched together in 2-3. The fruits of most varieties are red, but some are yellow, purple or even black. They are very pungent. 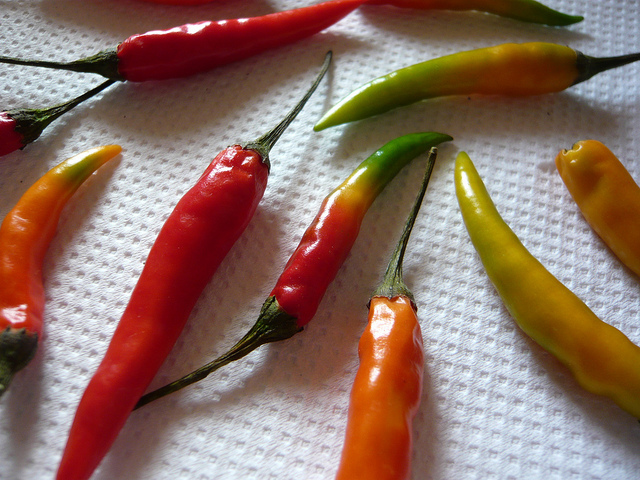 All chillies today have their origins in Mexico, Central America and South America. They were spread via the Spanish and Portuguese empires and are still grown in their former colonies in Africa and Asia. The chillies found in those areas today were cultivated by these European colonists and traders as they moved around their empires. If you can’t purchase individual bird’s eye chillies buy a small container and put them in the freezer. Just take out what you need to use. They will last frozen for at least six months, if not longer. I find they’re easier to chop when frozen as well. Shallow frying with cornstarch is a great substitute for batter. 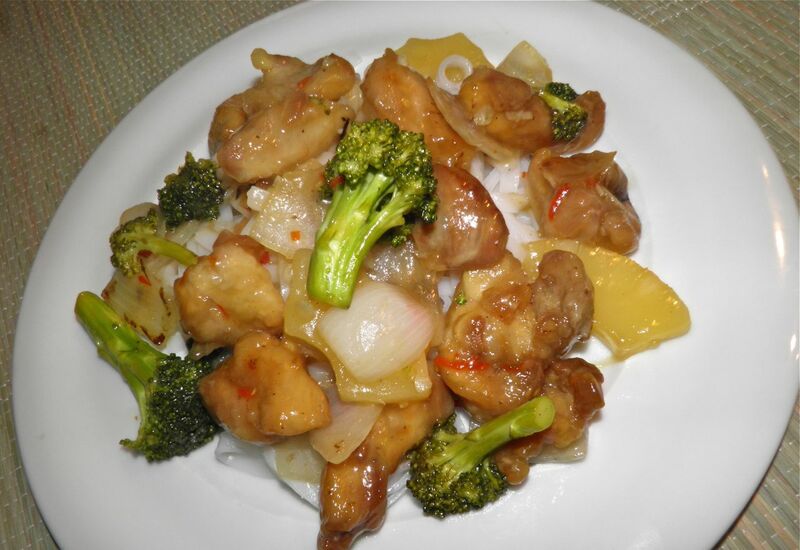 To shallow fry the chicken, heat the 1-1/2 cups of oil in a wok until a tiny bit of water dropped in it sizzles. 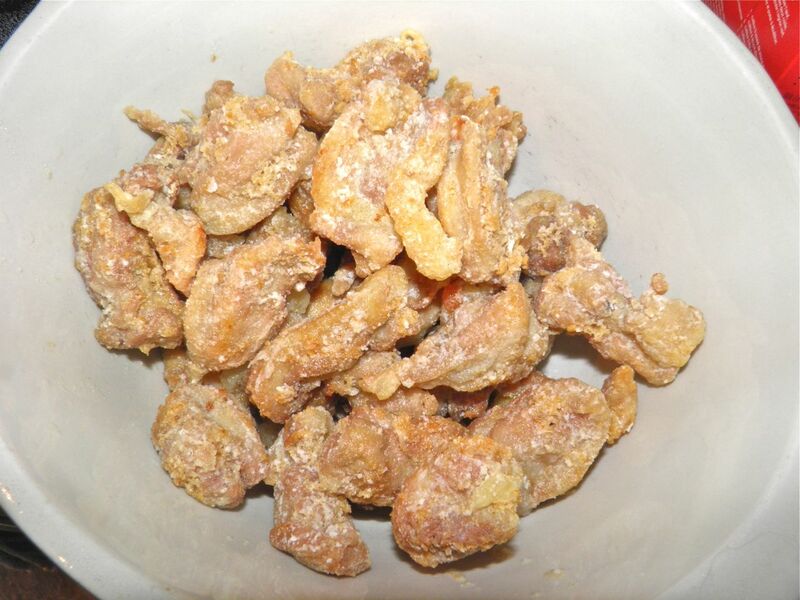 Coat the chicken pieces in the cornstarch and shake to remove excess. Place about 8 pieces at a time in the hot oil and fry until golden on both sides. Repeat until all the chicken is cooked. Remove the chicken to a dish as it is fried. Clean the wok and add the remaining oil. Fry the onion in the wok until it has started to soften slightly, about 3 minutes. Then add the broccoli florets and cook for 5 minutes. 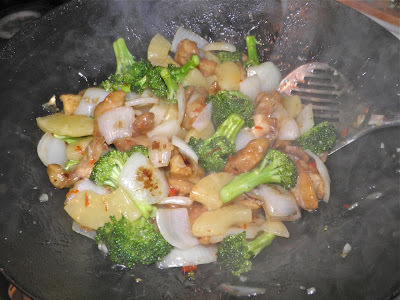 Add the chicken and pineapple and toss together in the wok. Then add the sauce and stir until the chicken and pineapple are heated through. Serve immediately on rice stick noodles. 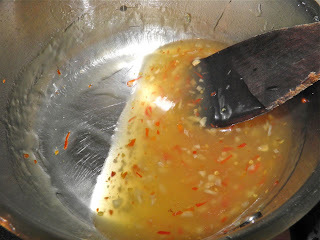 Fry the chillies and garlic for 1 minute in the oil. Add the sugar, vinegar and water and bring to a boil. Let cook for 2 minutes. Then add the cornstarch and cook until thickened, about 1 more minute. 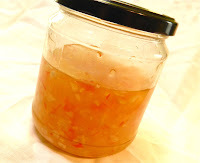 The result is a fiery, garlicky sweet-sour sauce. Certainly. I never thought of it. Thanks!